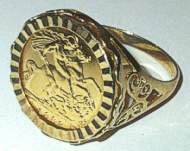 9ct Yellow Gold Half Sovereign size St. George and the Dragon style design Ring with SON in the shank design. SON 9ct Gold coin design ring. EXCELLENT 22 carat Genuine HALF SOVEREIGN COIN RING. 9 carat GOLD RING SETTING with GENUINE 22 carat HALF SOVEREIGN COIN. Ring Size 'T' HALF SOVEREIGN GOLD COIN RING. Watch style 9 carat Gold Ring set with Cubic Zirconia Stone. Excellent bezel Watch Ring with CZ surrounded by smaller stones. Large 9ct yellow Gold Claddadgh Ring set with Cubic Zirconia stones. 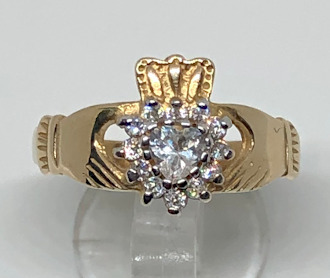 Popular CZ set Irish Claddagh style 9 carat Gold Ring. 9 carat Gold Ring Mounting shank with Bezel for Half Sovereign Coin. 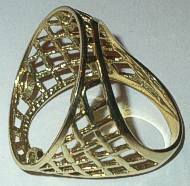 9ct Coin Ring Basket design shank mount. Large 9 carat Gold Basket design Full Sovereign size Coin Ring Mount with 9ct Gold Bezel. 9 carat Gold two tone DIAMOND set Coin style St. George and the Dragon Ring approx 19mm diameter across coin. Basket style ring shank with immitation St. George and Dragon half Sovereign style Coin set with two Genuine Diamonds either side of coin. Excellent 9ct Gold Coin styled ring with diamond cut bezel in 9 carat White Gold and set with 2 Real Diamonds. 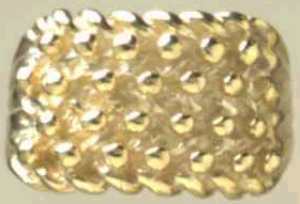 MENS EXTRA LARGE 9 carat GOLD KEEPER RING. EXCELLENT EXTRA LARGE MENS 9ct GOLD KEEPER RING. CLADDAGH RING 9 carat GOLD. 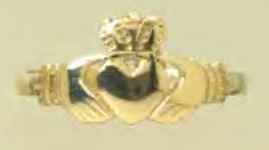 MEDIUM SIZE POPULAR CLADDAGH STYLE RING IN HALLMARKED 9 carat GOLD.